GLADSTONE — A pair of junior golfers added to their abundant links hardware here on Monday, but perhaps the biggest story was the lack of participation. Only 39 juniors played in the final round of the Upper Peninsula Golf Association’s annual tournament, with tourney director Tony Pouliot noting there were more spectators that include parents than there were players. “That is the question of the day,” Pouliot said in response to why more juniors didn’t participate in the season finale. Pouliot, owner-operator of Terrace Bluff Golf and Country Club, said “Kids have a lot of outside interests tugging at them,” citing a variety of conflicts and school-sponsored sports while noting high school football practice also began Monday. He said the five-course Delta County Junior Tour attracted 43 players this year and noted several major U.P. areas did not even have a participant here Monday. Pouliot pointed out cost should not be one of those hurdles, noting the UPJGA entry fee of $20 includes a post-round meal, range balls, golf and a gift. He also noted junior golfers receive excellent playing rates during the summer, ranging from no charge to $100. Success comes after instruction and with dedication, which was evident watching any of these youngsters swing a club Monday. Paxton Johnson is a perfect example. The Escanaba High School senior has enjoyed a sensational three months, winning her third straight U.P. Division 1 high school title, capturing the U.P. Ladies Golf Association championship and winning Monday’s two-player age 16-18 division. Bothered by a back ailment, she shot 82 to edge good friend Peyton Dube of Hancock by four strokes. Johnson also topped Dube in the UPLGA semifinals last month. The back restrained her Monday, noting she now uses a push cart rather than carrying her own bag. “It is a weird swing because it hurts,” she said. She had a triple bogey on the front nine and a pair of double bogeys on the back side. Dube, who won the U.P. D-2 prep title, is not intimidated by playing Johnson. 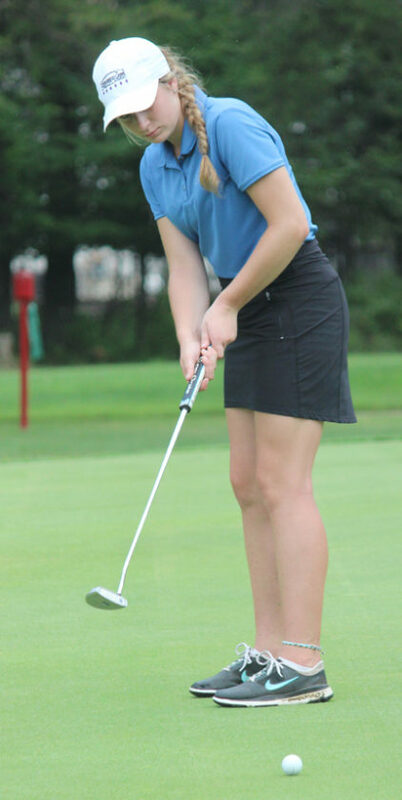 An incoming junior, Dube said her golf season is over because volleyball practice begins Wednesday, then she moves into basketball before playing golf and softball in spring. “I like playing a lot of sports. I’m glad I’m able to play as many as I can while I can,” she said. Two of the boys’ winners are also prime examples of taking advantage of junior golf. Rudy Peterson, who won the U.P. Division 1 prep title for Gladstone two months ago, had a sharp 1-under-par 71 to win the 16-18 division by three strokes over Tyler Bergwall of Marquette and Nate Rousseau of Escanaba. Peterson left the golf course to get ready for his first football practice at 5 p.m.
Another example is Bryson Mercier of Powers, a member of Hermansville Wild Pines Golf Course who has enjoyed enviable success at junior events in Green Bay, Wisconsin, and Norway. He won the 14-15 division with a nifty 74, falling just short of taking the overall best score and big trophy. “I’m not disappointed. I was in position after the front nine (par),” he said. Mercier, along with Rousseau, teed off this morning in the U.P. Golf Association men’s tournament. 8-9 boys: Dylan Pond, Marquette, 55.